Below is a short description of our most popular types of CE Recognition. Some are available for any participant, while others are provided only for members of specific professional organizations. AIA is offered only for members of this particular professional organization. Members of AIA will have their verified attendance records submitted to AIA within ten days after the conclusion of the webinar. AIA members must provide their membership number when requesting AIA credit. CA licensees must complete five hours of coursework on disability access requirements within the previous two years of license renewal. The coursework on disability access requirements must include information and practical guidance concerning the requirements imposed by the Americans with Disabilities Act of 1990 (Public Law 101- 336; 42 U.S.C. Sec. 12101. We provide a reporting form at no cost that can be used to demonstrate verified attendance of the required content. Rehabilitation Counselors who request CRCC CE will be provided with a certificate upon verification of attendance. This versatile certificate of attendance is offered at no charge to any participant whose attendance can be verified either by webinar sign-in or by telephone number. This free certificate of attendance is offered to any participant whose attendance can be verified either by webinar sign-in or by telephone number. 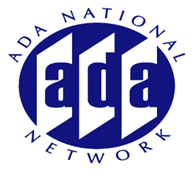 Offered for ADA Audio, ADA Legal, ADA Accessible Technology and Accessibilityonline webinars. Architects who are members of the Land Scape Architects professional organization will have their verified attendance records submitted via the LA CES on-line reporting system within twenty days of the webinar. LA members must provide their membership number when requesting LA CES. Policy and procedures for requesting and receiving continued education recognition. Some of the contents of this website were developed under a grant from the National Institute on Disability, Independent Living, and Rehabilitation Research (NIDILRR grant number 90DP0091-01-00). NIDILRR is a Center within the Administration for Community Living (ACL), Department of Health and Human Services (HHS). The AccessibilityOnline program is funded through a contract with the U.S. Access Board. The contents of this page does not necessarily represent the policy of NIDILRR, ACL, HHS, or U.S. Access Board and you should not assume endorsement by the Federal Government.